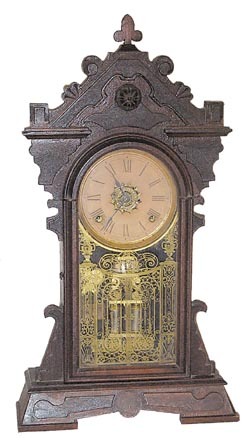 Ansonia Clock Co. parlor clock, "Lowell", ca 1886. Walnut case has never been cleaned and it is very dirty. Original glass, old dial, pendulum, beat scale, and full label. Even has the original signed key. Stands 23 1/2 inches high. The top ornament should be round, not a clover. It would look better without anything on top. Movement is running, but would sure benefit from a service call. 8 day, strike and alarm on a nickel bell. Ly-Ansonia No.1829.